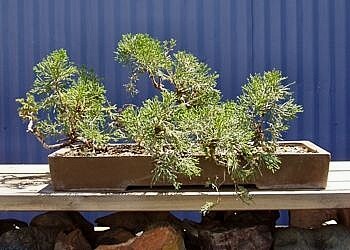 Better Bonsai: "Too Big, Too Ugly: Two Better Bonsai"
This prostrata juniper didn't start out as a beast. My friend Nuncie Destro had meticulously wired and shaped each branch. This is the way it looked in 1986. But even in this photo, the portion above the pot is much more developed than the rest. The zigzag motion of the cascade is thin, repetitive, and boring. 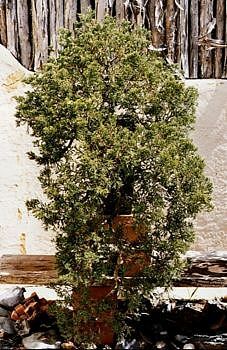 Over the next decade, as Nuncie's health declined, his tree became very overgrown and stressed. By 1999, you could barely see the pot behind all that foliage. The tree is now twice the size it was in 1986. For the next few years, the focus was chasing back the foliage and regaining health. The tree was trained in a cascading waterfall style. 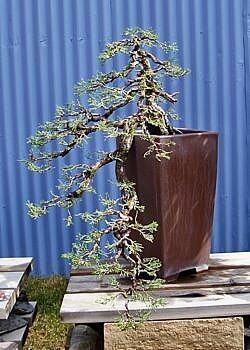 One problem with this design was that the original front obscured the structure of the tree and the pot with foliage. 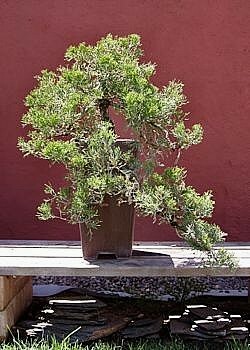 Another problem was the 54” length – too big for a bonsai. More than a third of the cascade was below the pot, making it difficult to display. Fortunately, this tree was quite healthy. From this angle, the trunk and branches were most appealing. Too bad you still couldn't admire them behind all that overgrown foliage. The first job was to shorten the wall of green by removing the bottom third of the tree. 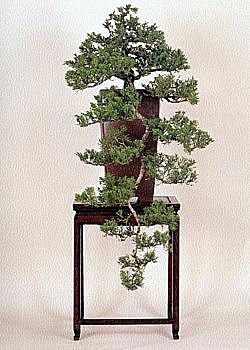 Now the bonsai could be placed on a bench. 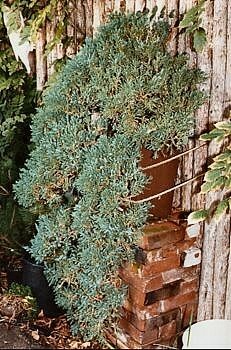 But the cascade hid the base of the trunk, and the line across the front of the pot and off to the right was unsightly. Also, the tip of the cascade and the bottom of the pot were at the same level; a cascade needs to be either longer or shorter than its pot. By rotating the tree clockwise about 45 degrees, removing unnecessary branches, and wiring the remainder, a most pleasing line of this cascade can finally be appreciated. You can see some of the nicely tapered trunk and branch structure. The embracing quality and the movement of the trunk are appealing as well. But now the pot seems too wide and overpowering. The color of the pot is perfect, but the shape and height are not right. I couldn't bear to trim and trash many years of cascade development. 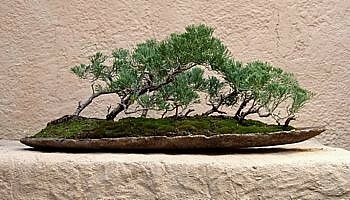 Because it's not too difficult to air-layer junipers, I thought I'd give it a try. The challenge was air-layering the tree while it was vertical. I scored the bottom (facing the pot) of the trunk, dusted rooting hormone on the cut, and fastened a board onto the unwanted cascade in four places. Wire was threaded through holes in the plank alongside the trunk, over the trunk with a protective (rubber tubing) barrier, and back through the wood. Then wet sphagnum moss was placed in and around the trunk. Window screen was stapled onto the board covering the trunk and moss. Every time I watered the tree, I watered the air-layer. After a year and a half, the sphagnum moss was full of roots. The tree was then divided – and the bottom of the cascade became a 31” wide raft. After several more years of growth, a new front, and a more suitable slab, this windswept raft is on its way to becoming a nice bonus bonsai. 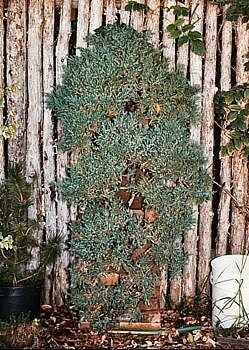 At a very manageable 34” tall, this cascade is now easy to display. 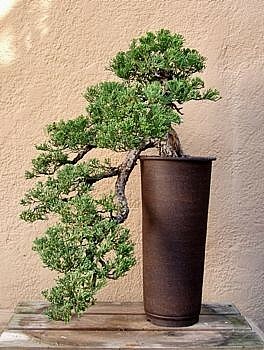 The shape and size of the pot balance nicely with the style and design of the tree. Spending time on a redesign and liking the results is gratifying – but starting with one tree I disliked and ending up with two trees I love is heavenly. © 2008 Cheryl Manning. All rights reserved.